Yes, I track the mileage on my shoes; and yes, I assign each pair a number. With my first pair of Hoka One One Bondi Speeds (HBS1) at just over 200 miles and with a coupon for trisports.com in my possession, I picked up a second pair (HBS2) this week. I originally wasn’t sure about Bondi Speeds, having been firmly committed to my Kinvara 3s for quite some time; but, I was looking for options to address my knee issues during June/July (which ultimately ended up being my IT band.) I already run trails in Hoka Stinson EVOs, so I knew and loved how those ran and figured the road shoes would be just as good – maybe even better. After reading a bunch of reviews, I went for it and fell in love. The Bondi Speeds have just the right amount of support and cushion, without the weight – some think they look “heavy,” until they give them a try (they only weigh 1.8 oz more than the K3.) 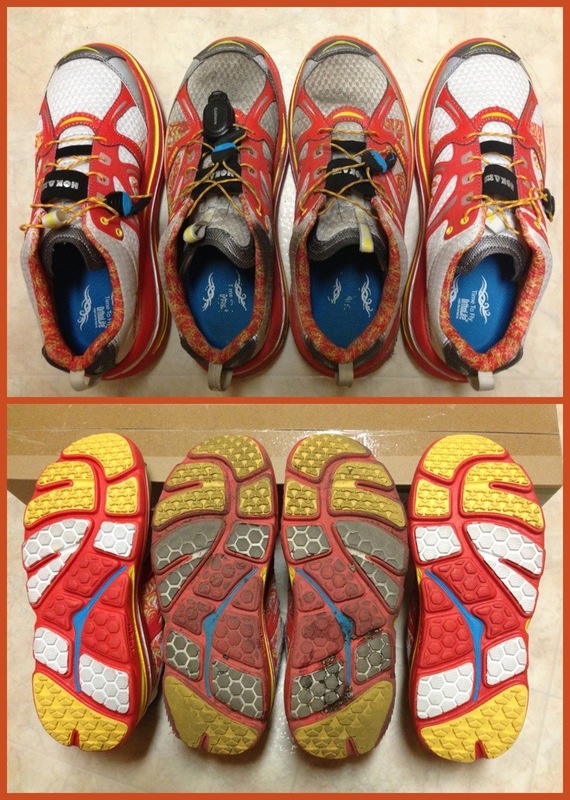 They have almost the same drop as the Kinvara 3s too (4.5mm vs. 4mm), so I haven’t sacrificed anything really with the switch – speed, comfort, etc. They have also worn well, showing minimal overall tread wear after 214.81 miles. I ran in my Kinvara 3s one day last week and still like them; but my primary road shoe is now the Bondi Speeds. I was torn at first, but not anymore. Don’t worry HBS1, you’ve still got miles to go and are still in the rotation! HaHa…some might call it a sickness! Thanks for stopping by! Yeah, I’ve been tracking almost since I started running…!